Fiamma awning installation kit for F45 awnings suitable for fitting to Ford Transit Custom Vans. 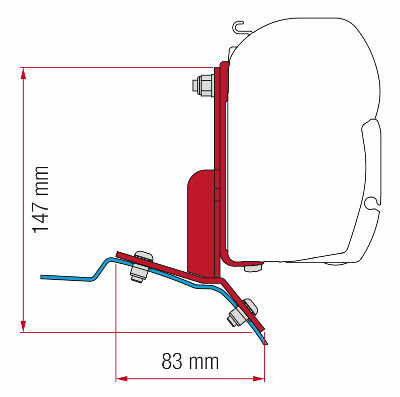 Fits to L1 and L2 vans with standard / low roof only. Fitting kit is attached to edge of vehicle roof with Rivnuts (supplied) and kit does not use roof rack mounting points so is compatible with most roof rack systems. Drilling of the van roof is required. Attention: Opening and closing operation of the awning must be performed with the van sliding door closed.